This year's American Music Awards was a reflection of the year in pop music, with women dominating the show, but not as nominees or winners. In categories like artist of the year and favorite pop/rock album, where men and women compete, no female acts were in contention. Only six female artists or groups that include women won in the more than two dozen fan voted awards handed out Sunday night. However, the legendary Diana Ross was given a lifetime achievement award, which former President Barack Obama rightfully noted was an overdue honor. But the women instead took over the show with powerful, incredible, emotional and inspiring performances from Ross, Pink, Kelly Clarkson, Lady Gaga and more. 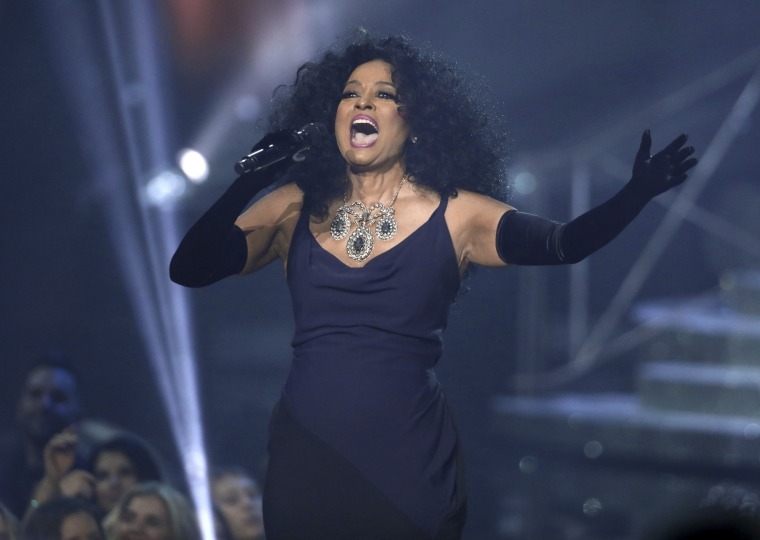 The anticipation for the performance by style icon, singer and actress Diana Ross escalated all evening with plenty of hype from her daughter and the show's host actress Tracee Ellis Ross. Ross noted that they were making history as the first mother and daughter to both host the awards show and even donned one of her mother's sequined tops during the show. The Detroit-born singer who started her career as a member of the Supremes received video messages from the Obamas as well as Taylor Swift. And she did not disappoint when she appeared draped in a purple, fluffy tulle coat and long black gloves. She delivered an upbeat and inspiring medley of her hits, including "I'm Coming Out," ''Take Me Higher" and "Ain't No Mountain High Enough." She ended the performance by inviting her children and grandchildren on stage as she poured her heart out to her fans. "This is my family and I am sending love out to all of you our global family and I really, really love to be here," Ross said. "And I feel so humbled by this." In a year marked by tragedies, from devastating hurricanes to mass shootings, the show started with a great homage to those who are the first to help in those situations, from police officers, to firefighters, to paramedics and the military. Actor Jamie Foxx put it succinctly that 2017 tested everyone's faith, but that unity was more important now than ever. Two of pop music's powerful vocalists, Pink and Kelly Clarkson, performed an epic version of R.E.M. 's "Everybody Hurts," with images from the recent tragedies on screens behind them. At the end of the performance, the two singers embraced in a hug and the crowd rose to its feet. It was not only a great performance, but set the tone for a night of uplifting and positive messages. Host Tracee Ellis Ross explained in her opening monologue that this was a night for women to shine after a year in which women all over the world have been empowered to "own our experiences, our bodies and our lives." "This is going to be an incredible night, filled with nostalgia, featuring earth shaking, ground breaking women," Ross said. "And there's going to be some men singing too." Christina Aguilera took on the daunting task of singing a medley of hits from Whitney Houston's "Bodyguard" soundtrack, while Demi Lovato's performance of "Sorry, Not Sorry," even had the Korean group BTS dancing in their seats. Kelly Clarkson, who was the first winner of "American Idol," killed her songs "Miss Independent" and "Love So Soft." Lady Gaga, who performed via telecast from a tour stop in Washington D.C., told her fans that "If you feel different, or feel not understood, don't you dare give up on who you are." Pop singer Pink is well-known for her high-flying stage performances, where she often flies over her crowds or twists and twirls on long ribbons. But she took it to a superhero level when she performed on the side of a high-rise hotel in Los Angeles with aerial dancers. During her performance of "Beautiful Trauma," Pink and the dancers performed acrobatic flips and poses while their graceful movement reflected off the building's glass windows like they were dancing on water. It was epic, unique and dramatic. And nobody had a better view than the hotel guests peaking out behind the glass as Pink and the dancers skipped across the glass like Spiderman.